This Jan. 29, 2014 file photo shows former Florida Gov. Jeb Bush speaking in Hollywood, Fla. With three little words, Bush set off a fury that serves as a potent reminder of how difficult the immigration issue remains for the potential presidential contender and the GOP. Bush, the Republican establishment's preferred White House hopeful, described illegal immigration as an “act of love” by people hoping to provide for their families. The backlash from his own party was swift and stinging. Photo Credit: The Associated Press, Wilfredo Lee, File. Former Florida Gov. Jeb Bush, son and brother of former presidents and a favorite of the Republican establishment to run for president in 2016, set off a fury this week with conciliatory remarks on immigration that served as a potent reminder of how vexing the issue remains for his possible White House ambitions and the party itself ahead of this year's congressional elections. Bush, who married a Latina, speaks fluent Spanish and governed a state with a booming Hispanic population, has long urged his fellow Republicans to show more compassion for those who enter the United States illegally. But when he described illegal immigration in an interview as an "act of love" by people hoping to provide for their families, the backlash from his own party was swift and stinging. Rep. Raul Labrador, accused Bush of "pandering." Sen. Ted Cruz of Texas, another presidential prospect, and House of Representatives Speaker John Boehner said the country should enforce the "rule of law." Republicans have been wringing their hands about immigration since President Barack Obama dominated the rapidly growing Hispanic vote in his re-election victory in 2012. Leaders of the party have called for it to win over Hispanic voters or risk becoming a minor party in the future as Hispanics steadily make up a larger portion of the electorate. A top issue for Hispanics is of course immigration reform, and some of the Republican party's most powerful insiders and financiers are concerned immigration could define the coming nominating contest in the way it did in 2012. Like Bush, Texas Gov. Rick Perry was jeered when he implied that his rivals were heartless if they opposed a law that lets some children of undocumented immigrants pay in-state tuition at public colleges. The nominee, Mitt Romney, took a hard line and advocated "self-deportation" for those here illegally. He won just 27 percent of the Hispanic vote, the lowest portion for a Republican in 16 years. "The worst thing that can happen to a political party is not for voters to decide they don't like you," said Alex Castellanos, a Republican consultant and former Romney adviser. "It's for voters to decide you don't like them, and that's where the Republican Party is right now." The Republican National Committee has urged the party to embrace an immigration overhaul, but comprehensive legislation remains stalled in Congress. Action is unlikely in an election year with high stakes. All 435 House seats, and 36 in the Senate, are on state ballots. Republicans need to gain only six Senate seats to win majority control from Democrats. The political calculus makes the party's core base of predominantly white voters critical, so House Republicans want to avoid an immigration fight that could alienate them. For Bush, the debate is personal. His wife, Columba, was born and grew up in Mexico. The two met while Bush was an exchange student there; she is now an American citizen. On Sunday, in an interview with Fox News before an audience at the George Bush Presidential Library in Texas, Bush said immigrants who enter the country illegally should, in fact, pay a penalty. But he added that he viewed such a violation as "a different kind of crime." "Yes, they broke the law, but it's not a felony," he said. "It's an act of love." Hispanics are a crucial voting bloc in an increasing number of crucial states, from Florida to Colorado to Nevada. Some see a new opportunity for the Republican party to appeal to Latinos, many of whom have soured on Obama because of his administration's record-setting number of deportations. "Hispanics are eager to hear from a leader in the Republican Party talk about immigration in the way that Jeb Bush talked about it," said Janet Murguia, president of the National Council of La Raza, the country's largest Hispanic civil rights organization. In contrast to the 2012 nomination fight, most of the Republicans' potential 2016 presidential contenders have signaled support for some kind of immigration overhaul. But they remain deeply divided over whether legislation should offer a pathway to citizenship for those living here illegally. After the Senate passed a bipartisan measure last year that would do just that, the barrage of conservative criticism virtually silenced the party's most outspoken immigration advocates, including Florida Sen. Marco Rubio. The furor over Bush's remarks shows the potential perils of picking up the issue, especially in the early voting states that play an outsized role in choosing party nominees. Bush's "act of love" comment was pithy and provocative enough to stir deep discomfort in a party still searching for a single message on the subject. And it challenged Republican officials to disagree without further alienating a voter group they're trying to attract. Bush has struggled to articulate his views in a party that has changed dramatically since the last time he ran for office in 2002. Bush released a book last year that championed legal status- but not citizenship - for illegal immigrants, seemingly contradicting his past statements. But in recent months, he has been giving speeches around the country that often include a full-throated defense of an immigration overhaul. Speaking at a recent financial advisers' conference in Florida, Bush lauded immigrants as "the risk takers," arguing that they embody the entrepreneurial spirit of America and invigorate the country's economy. This is interesting that it's such a big deal in the political world. I don't see what the big problem is with Bush challenging the American people to be more kind to people who arrived in the US illegally. After all, the law that requires people to go through a legal process to gain citizenship is completely different issue than the way that citizens should treat ALL people who do not pose an immediate threat to them; with kindness and respect. I don't see Bush looking to change the laws or regulations on illegal immigrants. He is simply pointing out the truth that families come to the United States illegally because they may not have the means to go through the entire legal process, and the motive does not come from maliciousness, as many Americans seem to think. It comes from love for their families, and concern for their wellbeing. I don't hate this comment from Bush. I agree with your comment, as well as Bush's. Often as humans, we are quick to judge and look at illegal immigrants as people who don't mean well, and are coming it America to ruin our culture. But I like thinking of it as an "act of love", because people want to find a better future, to help themselves and their families. It is true that people come to America because it's the land of the free and they want to come here to improve their lives. I totally agree with you that all Bush is trying to do is make people aware of an immigrants situation and how people should have respects for them because all we know, they may be trying to go through the process, but we just aren't letting them. What I mean, we automatically assume that they are just immigrants after they have been labeled that. We often don't give room for explanation. It is like when Alexander in her video lecture stated that once that African American male said he had a criminal background she immediately stopped listening making discrimination legal then. It is very sad to see that society has come to this. People don't want to listen, when in reality, they are trying to become a citizen, but yet we are quick to assume that they are just trying to take over. I agree that the comment from Bush isn't at all bad. But, I do take the stand that those here illegally have broken our laws and should not be granted the same rights as those who have fought and died to be called Americans. I completely agree with you. Yes, we should treat everyone kindly as a nation, but these people already broke our laws once. Who is to stop them from breaking them again? I do not think that illegal immigrants should be granted the rights of citizens unless they gain citizenship through the path that immigrants have always gone through. It is not just illegal immigrants that break American laws. Many Americans break the laws every day, such as speeding, driving drunk, and not paying taxes to name a few. Who is to stop them from breaking the laws again? 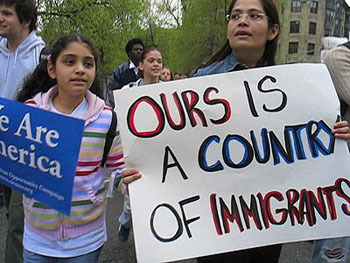 And the path that immigrants have always gone through has not been the same; there were no immigration laws until 1875. “The Immigration Act of 1875 was the first immigration law that excluded groups of people from the United States—and women were part of that exclusion” (Library of Congress). Changes have been made continually to immigration laws over the years, to include how many can become citizens and from what countries. Library of Congress. www. http://memory.loc.gov/ammem/awhhtml/awlaw3/immigration.html. I must say that I respectfully, completely disagree with your statement. I have been dating someone from Mexico for three years now and his family came to the United States a decade ago. Although they came over legally (they got their appropriate visas before arriving), they have still not been able to attain citizenship. They are very good people and love America just as much as we do. My boyfriend and his sister are both college students with good labor jobs. I do not think Americans realize how difficult it truly is to become a citizen of the United States of America. We were born into citizenship - It was easy for us. It takes several years for them, is a very difficult process, and they only let a certain amount of immigrants from each country become a citizen. There are millions of latinos in America today. There is no way that they could all become citizens, even if they all came over legally. That is very sad. I have heard of acquaintances who came over illegally because they needed to come to America immediately due to troubles at home (violence, drugs, money) and they were either turned down legal visas or could not wait until they were granted access. They broke our laws, yes, but wouldn't you break the law if your children were in danger every day of their lives? The law needs to be changed. It truly is an act of love. The majority of these people are not criminals and are actually very nice, hardworking people who will work jobs we do not want for much less than they should. I recommend that you watch the documentary "Who is Dayani Crystal?" It is on Netflix. It will give you a new perspective on this issue and you will, hopefully, realize the urgency for a change in the law. I can agree that these statements are not bad at all. It's good that somebody is trying to stand up for illegal immigrants and should be shown love. This is such a rough issue though. Illegal immigrants have broken the law and entered our country illegally and yeah they may have done this because they don't have the means to go through the right channels, but they still have broken the law. I'm not saying they don't deserve to be citizens if they decide to go through the right channels, but until then, I think that they still need to be productive citizens of society and obey our laws. If they don't then I believe they should face the same justice system we do. i agree that it isnt completely right the way they went about to get into america. however, the people that are here now did the same thing. the pilgrims broke laws to get here. everything we have as a land of free was by pushing or breaking the laws and boundaries that kept us is place. they want more for themselves just like females and minorities when they fought for the right to vote. i agree that people immigrating to the u.s. is an act of love. most people come here in order to make more money for their families that are still in the foreign country they came from, or to give their family a better life here in the u.s. i think those acts are ones of love. most people however, just view it as these people trying to take our jobs. but they dont stop to think as to why they are so desperate for these jobs; they too have families to feed. i think that these immigrants should be allowed to be here whether it be just legally or as actual citizens. this country was built upon immigrants. why is it now that immigrants are not allowed? Many of the immigration laws established throughout U.S. history had to do with limiting the number of non-whites from gaining access to the resources that the whites took by invading and killing the Native Americans (who had been here thousands of years). These ‘founding fathers’ wanted a better life with equality and fairness away from their own countries, (England specifically). I agree with Bush stating the illegal immigrants are coming here out of love and a better life for their families. We do not see illegal immigrants today trying to invade, take over resources, and kill (on enslave) the white Americans that have been here a couple hundred years. Although some have argued the resources many of the illegals are taking over are jobs…the majority of illegal immigrants work at jobs that many citizens don’t want and/or for less (under the table). Yes, the immigration laws need to be changed and for those illegal immigrants living here already if they are made citizens they would not have to work ‘under the table’ but at the same time change the laws to have those jobs legit and illegal immigrants become taxpaying citizens. Which means people (possibly white majority?) that use illegals as maids, or landscapers or other jobs (many I am probably not even aware of) would have to pay their portion of taxes on the employees they have. I like what Bush said, to some extent. I think America is a place that is free, hopefully and full of opportunity. This in turn makes immigrants want to come here and provide their families with a better future. I don't see this as a bad thing but I also think that because of what laws and rules are broken, immigrants shouldn't be given the exact opportunities. Illegal immigrants might of come here to help their lives but they have broken the law and that's not fair to those already in America living by the rules. But this is also hard because I believe everyone deserves a chance for a better life. This topic is a hard one to talk about because there are a lot of pros and cons for each side. With that being said, I do appreciate that Bush is showing this situation as an act of love. I guess to me, it's a situation where you must think of yourself in the other persons shoes and then take on the topic that way. I do not believe that what Bush said was wrong. He was stating how he feels and I believe that most of the time they do come here because they want a better life for their family and for themselves. Even though they are coming here for a good reason, what they are dong is still illegal so there should be some repercussions for what they are doing. They should not get the same rights as those that came here legally. I know Bush said this statement for political gain, but he still making a very good point and is proving that this is still a big topic and that discussing immigration reform is still a big topic. He is showing that something needs to be done about immigration because they are still going to come into the country because they want to improve their lives. This is a very tough situation and their are many aspects of immigration that need to be discussed before anything can go forward. I was shocked to believe that a Bush could be married to someone of another culture and even speak their language fluently. This actually gave me a lot more respect for this person who I automatically had a stereotype that he was more in line with the thinking of the former President Bush. Immigration is a difficult issue for Americans because as the girl in the picture shows, this is a nation of immigrants. There is no way that anyone would self deport as Mitt Romney requested so some other solution needs to be made. It is such a hypocrisy because on the one hand anyone can come here and have a baby and get citizenship for that baby immediately, but if you sacrifice everything to get here and have even been here for many many years you can still lose it all.